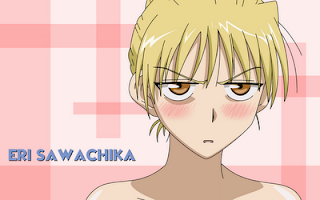 This week's Tsundere might not seem an obvious choice at first, as she starts off School Rumble as a side character extraordinaire, however, after the main male lead inadvertently shows affection for her (which he has none, a hallmark trait of School Rumble are the numerous misunderstandings and awkward situations) Eri quickly rises to the top as one of the main female stars of the show and her hostility/affection for Harima makes her latent Tsundere side go full blown. 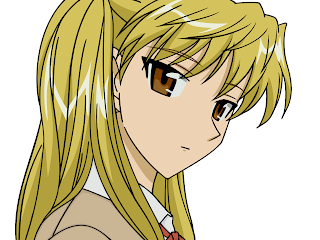 As wacky, uneven and fervent as School Rumble is, Eri stands out as one of the few actually fully realized multisided characters, helped in part by her Tsundere side. Towards her girl friends she is sweet and sophisticated, the model of a wealthy aristocratic family. 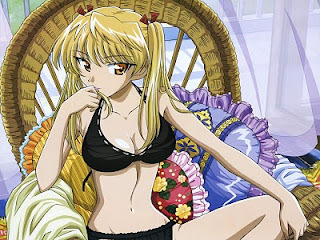 However, towards Harima, the man least likely to receive any attention from attractive women, she is hostile, sometimes violent, and just a little bit sweet towards him. This makes for the end of the first season almost tragic, as she is the only one who seems to be baffled that a guy who seemed to be head over heels in love with her, now seems completely oblivious to her existence. Regardless her strong willed attitude, mixed with a sense of sophistication and beauty (not to mention the ponytails) make her the shining paragon of a Tsundere, and thus deserves to be honored as such.